Many class room teachers neither have the experience, nor the qualifications, to confidently teach the primary school gymnastics component of the PDHPE curriculum or Victoria’s AusVELS programs. Our instructors are not only highly trained and qualified in this area, but also thrive on the energy and challenges presented. Our well trained, caring staff work in pairs to provide excellent, safe lessons for the students. 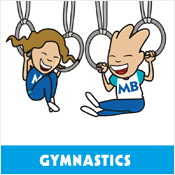 We offer a variety of activities using specialist gymnastics equipment such as balancing beams, bars, tramps, vaulting boxes and hand held equipment. Our lessons cover all stages & skill levels. Our goal is to make the lessons both challenging, yet interesting for the children. Our goal is to ensure the students have FUN!